In our modern, high-tech society, traditional craftsmanship has increasingly had to give way to mass production. Synthetic materials have taken over from natural ones, and the world of construction in 2008 appears to revolve around efficiency, standardisation and cost optimisation.§However, a growing number of individuals are reacting against these tendencies by working to create authentic and personal living environments.§This new home-design philosophy has had an impact in many areas: a lot of distinctive old residences, farms, country houses and other homes are undergoing careful restoration; industrially manufactured furniture is being replaced by unique, handmade pieces; and preference is given to natural materials and finishes, rather than mass production.§Within this context, it is easy to see why valuable construction materials and pieces from the past are being reclaimed, restored and reintegrated into properties: these architectural antiques ensure that every home can have a unique cachet.§Whether it s an 18th-century wooden floor, reclaimed Burgundy slabs, authentic handmade roof tiles and slates, antique fireplaces, or other historic features, these construction materials always offer the opportunity for every home project to have an authentic character, as is clearly illustrated by the many inspiring projects featured in this book.§Dealers in antique construction materials also occupy a very important place in these developments, convincingly demonstrating how their unique discoveries, often to be found in a variety of warehouses and showrooms, can be integrated into magnificent homes. 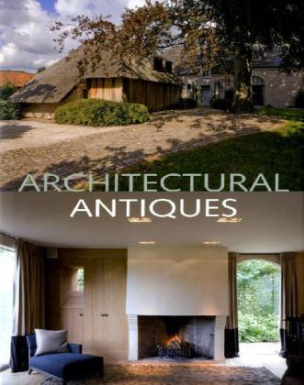 The growing professionalism within this sector has in recent years ensured that an increasing number of architects, interior specialists and private individuals have been able to find materials that suit them perfectly within the ever-expanding assortment of architectural antiques.